The Irish International Freight Association (IIFA) hosted a dual celebration on 12 September for graduation of the 2017-1818 IIFA FIATA Diploma class group and the tenth anniversary of the FIATA Diploma in Freight Forwarding through IIFA. Some 31 Participants from the 2017-18 Class Group became FIATA diploma holders on the night, which also featured guest speakers from previous FIATA diploma class groups. Gabbie White, director, global logistics at Alexion Pharmaceuticals Inc., Sinead Wheatley, key account manager at Kuehne & Nagel Ireland and Glen Warnock, chief executive of Emerald Freight Express shared their experiences of their training and described what further education has done for them and what their careers have been like since. IIFA president Bob Rainsford congratulated the new graduates (and those previous graduates who attended on the night) describing them as “the future of the industry”. He pointed out that diploma graduates have progressed to become owners of IIFA member companies, managing directors of multinationals, logistic managers or involved in specialised areas such as customs and trade compliance coordination. 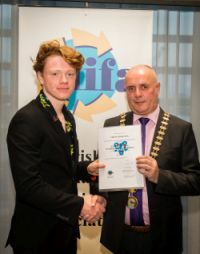 Also celebrated on the night was Philip Thornton of Wells Cargo Logistics who, as a fourth year student completing work experience in the industry over the past year, undertook the full FIATA Diploma course as a project during his transition year in Secondary School.